"The liberty of man consists solely in this: that he obeys natural laws because he has himself recognized them as such." Born in May 1814 (the exact date is disputed), Bakunin became involved in politics in his late teens- his first known political effort was made at the age of 22 (1836), when he translated Hegel's "Gymnasial Lectures" into Russian- marking the first time Hegel had been translated into Russian. In 1842 Bakunin wrote "The Reaction in Germany"- an article whose popularity spread throughout youth and underground groups. In his essay Bakunin debated Hegel's emphasis on the positive in the dialectical process, asserting instead that the negative is the creative driving force of dialectics. The ending line of this essay is one of his most quoted phrases, "The desire for destruction is, at the same time, a creative desire too." Bakunin first met Marx and Proudhon in Paris, 1844 (See Bakunins' Recollections on Marx and Engels). Shortly thereafter; Marx, Feuerbach, Ruge and Bakunin founded the newspaper Deutsch-Französische Jahrbücher. In 1849, after years of revolutionary efforts throughout Europe, Bakunin was arrested. 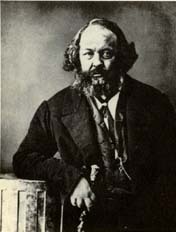 Incarcerated in Chemnitz, Bakunin was sentenced to death in Saxony, but had his sentence commuted to life imprisonment. By request of the Austrian government Bakunin was extradited to Austria, sentenced to death again, and again his sentence was commuted to life imprisonment- in Austria his stay was accompanied with severe beatings and torture. In 1850, Bakunin was extradited to Russia (his first prison stay in Russia was in the infamous dungeons of the Fortress Peter and Paul), where Bakunin spent his next 11 years in various prisons and finally, Siberian exile. In June 1861 Bakunin escaped Siberia, and travelled through Japan and North America to London. After imprisonment, Bakunin wrote the large majority of his political works, and further consolidated and refined his anarchistic theory. The driving force throughout Bakunin's life, unquestionably stronger after his escape from prison, was towards emancipating the human spirit- to achieve equality and liberty for all people. "I am a free man only so far as I recognise the humanity and liberty of all men around me. In respecting their humanity, I respect my own." "The trouble lies not in any particular form of government, but in ... the very existence of government itself." "To organise society in such a manner that every individual, man or woman, should find, upon entering life, approximately equal means for the development of his or her diverse faculties and their utilization in his or her work. And to organize such a society that, rendering impossible the exploitation of anyone's labor, will enable every individual to enjoy the social wealth, which in reality is produced only by collective labor, but to enjoy it only in so far as he contributes directly toward the creation of that wealth." "What I preach then is...against the government of science....the sole mission of science is to light the road. Only Life, delivered from all its governmental and doctrinaire barriers, and given full liberty of action, can create." The revolution would be created through "the spontaneous organisation of the work and the common property of the manufacturing associations and by the equally spontaneous formation of the communities, not by the supreme posturing of the state." "...equality without freedom is the despotism of the State.... the most fatal combination that could possibly be formed, would be to unite socialism to absolutism; to unite the aspiration of the people for material well-being... with the dictatorship or the concentration of all political and social power in the State... We must seek full economic and social justice only by way of freedom. There can be nothing living or human outside of liberty, and a socialism that does not accept freedom as its only creative principle...will inevitably... lead to slavery and brutality." "...facilitate the birth of the revolution by spreading among the masses ideas that correspond to their instincts, and to organise not a revolutionary army, because the army must always be the people, but something in the nature of a revolutionary headquarters, consisting of ... friends of the people, capable of serving as intermediaries between the revolutionary idea and popular instincts." "But if we are anarchists, you will ask, what right... have we to wish to act on the people? Rejecting all power, with what power... will we direct the popular revolution." "With an invisible force, recognised by no-one and imposing itself on no-one, through the collective dictatorship of our organisation which will be the more powerful, the more it remains invisible and unrecognised..."
"to assist the self-determination of the people on the basis of the fullest possible equality and... [maintain] liberty, without the slightest interference of any power whatsoever, even provisional or transitional." "It is indispensible that the people be inspired by a universal ideal,... that they have a general idea of their rights, and a deep, passionate...belief in the validity of these rights. When this idea and this popular faith are joined to the kind of misery that leads to desperation then the Social Revolution is near and inevitable and no force on earth can stop it." "...if instinct alone sufficed to liberate peoples, they would long since have freed themselves. These instincts did not prevent them from accepting... all the religious, political, and economic absurdities of which they have been the eternal victims. They are ineffectual because they lack two things... organisation and knowledge." Maximoff, G.P. "Political Philosophy of Mikhail Bakunin"; © 1953.